MONTREAL -- Adonis Stevenson avenged his only loss, knocking out Darnell Boone with a pair of lefts in the sixth round Friday night at the Bell Centre. 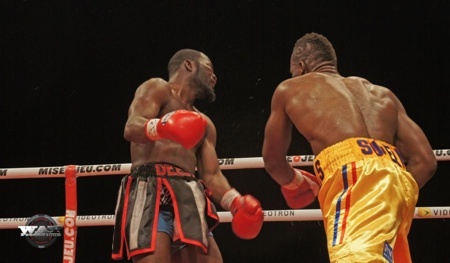 Stevenson (20-1), from nearby Longueuil, lost to Boone (20-20-3) on a second-round TKO in 2010. The left-hander, fighting at 173 pounds, forced Boone to take a knee with a right shot to the body early in the sixth, then stunned him coming out of a corner with a left uppercut and followed with a straight left that sent the American to the canvas. In the co-feature, Eleider Alvarez (12-0) unified two minor belts with a third-round knockout of Nicholson Poulard (19-3) in a match of world-ranked Montreal light heavyweights. Alvarez added Poulard's NABA title to his own NABO belt.